Two things I love: art and war. Odd choice of words, perhaps;I do not love war, if anything I'm pretty much anti-war but there is something about the two world wars in particular that fascinate me. Mostly I think I am interested in the way people reacted to war, the literary and artistic responses and the general cultural responses to such massive catastrophes. 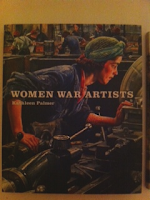 Recently I have rekindled my love of all things art related and browsing amazon one day I came across an Imperial War Museum/Tate publication called Women War Artists by Kathleen Palmer. Now, war in general I find interesting but start me off on women and war and you will have trouble trying to shut me up. This book explores the role of women war artists up to the present day. It is engagingly written and contains some interesting facts but I did find the placement of the images a bit irritating as they are not always on the page where they are discussed. The images themselves are very powerful and really give an insight into the role of the woman artist in a world where the female role in war is still questionable. Definitely worth a read or a quick flick through the pictures (I know I'll go back and do this occasionally). I visited Tate Britain a couple of weeks ago and found another Imperial War Museum publication in the bookshop there. Tate Britain has a Paul Nash on display and I find his war art particularly striking. This book has reproductions of some of his work with accompanying discussions. Again the information is engaging and has introduced me to some new artists. The layout is much more concerned with the pictures themselves rather than a critical discussion of the war artist so it did irritate me less. Always a good thing! 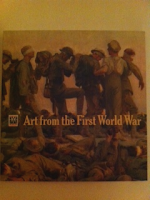 I found it to be a good introduction to art from the First World War. I've found that frequently art history books will skim the war and not always give it the detail it deserves but this is focused and most fascinating. I'm really pleased with these purchases and I think the Imperial War Museum has done a good job of identifying the most striking and most significant artworks created in wartime.